Contact us to purchase our Church Family Favorites Cookbook. 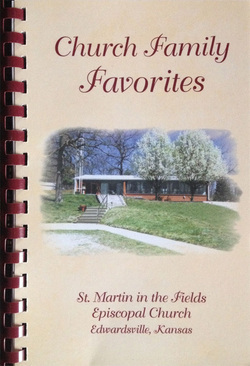 Thank you to each member of the church who took the time to share favorite recipes for this cookbook. We've emjoyed them over the years as you've shared them with up at our church family get-togethers. An extra thank you to those who managed to find recipes shared in earlier times by members of our church sho are no longer with us. Their sprirts return with memories of the meals shared. Thank you to the members of the Cookbook Committee, who collected the recipes, typed them, checked them, adjusted them and enjoyed them. Patty Trickett, Bette Carbery, Margie Claxton, Susie Green, Dana Almond, Jan Almond. Thank you, too, to those who purchase our cookbook. We hope that you will enjoy the treats and meals we've enjoyed during our 50+ years of church family celebrations.